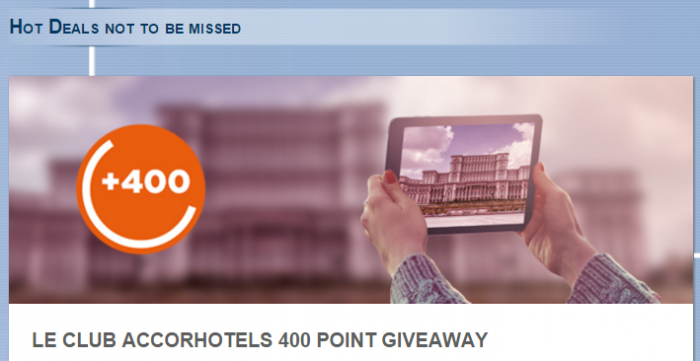 Le Club AccorHotels has launched a promotion for 400 bonus points Romania promotion. The offer is valid for stays between December 11 – February 29, 2016, that are booked November 11 – February 29. Note that this offer requires you to book specific “Hot Deals” rate in order to earn the bonus. There are seven Le Club AccorHotels properties in three cities in Romania and all of them are participating. Just to keep this offer in mind if you happen to visit the country during the winter months. 1. General Le Club Accorhotels terms and conditions apply to ” Hot Deals not to be missed” offer. 2. This offer is valid for any stay done between 11/12/2015 and 29/02/2016 in one of the participating hotels, and booked on Hot Deal rates between 01/11/2015 and 29/02/2016. Upon booking, the client accepts to be charged the full price of the stay, this amount being non refundable in case of cancellation or change of dates of stay. Full amount of stay is payable in advance by credit card at booking time. 3. This offer entitles Le Club Accorhotels Loyalty program members, regardless of their status, to benefit from earning 400 bonus points in one of the participating hotels in Romania/Bucharest.